Hilton entered the timeshare market in 1992 with their Hilton Grand Vacations Club and today they have over 100,000 members and 37 resorts, 10 developed by Hilton themselves and 27 managed on behalf of affiliates. The Hilton resorts cover beach, ski, golf/spa and themed entertainment destinations and they have over 20 resorts in Florida. This makes Hilton Grand Vacation Club one of the largest managers of Florida vacation club resorts, covering the Central, Gulf Coast and South eastern regions. Hilton also have resorts in California, Colorado, Hawaii, Nevada plus overseas resorts in Mexico, Portugal and Scotland. The villa apartments range from studios to one, two or three bedrooms and most come with full kitchens, separate living and dining areas, luxury bathrooms. The two and three bedroom villas will comfortably sleep 6 to 8 people. Hilton offer deeded properties which can be handed down to family or friends and can be kept indefinitely but are subject to property (real estate) taxes. Hilton use a points system called ClubPoints, based upon the size of unit and time of year (season) that you purchase your week in but the Hilton owned resorts work differently to the affiliated resorts. The cost to join the Hilton Grand Vacation Club varies by property and season; the more you spend the more you get and the greater degree of flexibility in terms of size of unit and season of stay. 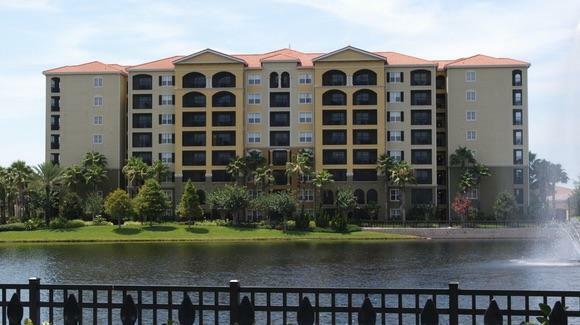 A week in a one bedroom unit at the Hilton Grand Vacation Club resort in Orlando with a week in the Gold season (covers early January/February, late April to June, mid August to late October) would cost around $15,000 with just under $600 closing fees and $450 per year in annual fees. This is equivalent to 3,400 ClubPoints. Annual maintenance fees are based purely on the size of the unit, the season you purchase has no effect. Reservations can be made up to 12 months in advance and weeks can be split, (3 nights minimum). You can exchange your week for a week at another Hilton Grand Vacation Club resort worldwide or through Resort Condominiums International (RCI) which gives access to more than 3,700 resorts worldwide (fees apply). Some of the affiliated resorts operate an exchange program through Interval International (II). The Hilton Grand system for timeshare booking is based on four levels of seasons, ranked from Platinum which is the highest season, down through Gold, Silver and then Bronze which is the lowest season (most Florida resorts don't use Bronze). Seasons will vary by resort as what is deemed the highest season in Central Florida will be different to the highest season on the Gulf Coast and Southern Florida. One thing about the way that Hilton Grand Vacation Club seasons work is that you can rent an equivalent sized unit in any other Hilton Grand Vacation Club resort during the same season; i.e. if your one week is in the Gold season, then you can rent any Gold week at any other resort for the same number of points but their is a transfer fee and you can reserve it up to 9 months in advance. take an alternatives vacation including cruises, RV, hiking, biking, rafting, motorcycle and houseboat travel, Fiesta Americana Hotel accommodations throughout Mexico and South America, and unique adventure travel options in 90 premier destinations worldwide. You can also borrow from next year's ClubPoints for use in the current year or deposit unused ClubPoints into next year's account. ClubPoints expire at the end of each year and therefore unused points need to be converted into HHonors points (fees apply), banked into next years allocation or used for RCI exchanges.